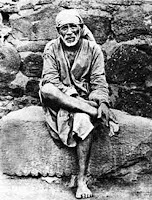 Mar'20 2010: "Whosoever puts their feet on Shirdi soil, their sufferings will come to an end - Sai baba". It was our that time of the year, when we usually make our annual Shirdi trip.If you didn't know, Shirdi is famous for the shrine of Sai Baba.Couple of friends' cousins who were in city were keen to visit Shirdi, so were we.Hence, without too much of planning, we just decided to go.Shirdi was our next destination. Personal Vehicle: Its around 300 kms route. You have to take the NH3 - i.e. the Mumbai Agra Highway.There are signs all along the way.You can either go straight to Nashik and then take the Manmad-Ahmednagar highway. The other route is On NH3 itself, there is sign from where you can take a right to Shirdi, however, beware. This route doesn't have good roads like the former one. Public/Private Transport : Getting to Shirdi is probably one of the most easiest journeys you can make, especially if you are travelling by public transport.There are innumerable options available.Just walk into any tours and travels office, you are bound to find some good options for Shirdi.We booked our journey through redbus. The transport company was Neeta travels.Neeta provides regular bus services to Shirdi, we opted for a day travel instead of the usual night trip.It cost us Rs.400 per person. There were 5 of us.No bargains were entertained.We boarded a bus from Borivali West (near Gokul Hotel) at 5.45 am. The bus had pickups all over Mumbai.We initially moved along the western express highway and then turning over to the harbour side and central side.The last pickup being at Thane (Teen Hath Naka flyover - nr Neeta tours and travels office) at 7.30.It was a video coach bus, fully a/c, with comfortable recliner seats.However, this wasn't a new bus.Our seats were right ahead. Usually those are not the best seats.The curtains were not washed, and there was a distinct smell emanating in the bus.The smell was more evident near the seats ahead. [Always take seats in the middle or rear.] Those are some of the quirks of public transport. The bus has two halts during the journey, one at Neeta hotel and the other one just near shirdi, probably around 50 kms away.Hotel Neeta was good, spacious.Being a early morning journey, we took regular breakfast items like idli,uttappa etc.It had nominal costs and tasted decent enough(less than Rs. 250 for a good breakfast for 5).The best thing about the hotel was the prompt service. I guess all Neeta buses have a halt there. We could recall that the last time we travelled by Neeta, we had stopped at the same hotel. I guess the hotel is owned by the bus service itself. Places to stay : We reached Shirdi at 2.00 pm.As you enter Shirdi, the first thing you realize is, its not a rural village/town any more.The place keeps getting busy, more crowded, more hotels, restaurants, more options. And the same has been the feeling in every visit.Usually the bus stops next to some decent hotel.Same was the case.Shirdi has lot of options to stay.Hotels offering Rs. 50 per person just for 4 hrs to hotels offering rooms for full day as well.There is a limited period in which you get the 50 Rs-offer (i guess only till noon). Its primarily for night travellers who need to use the room to freshen up.We got our rooms at the "Hotel Sai Shiv Ram"(Ph.No: 09371915349). It has A/C- Non A/C Rooms.Located behind Hotel M.T.D.C. One of their agents whom we met, just as we got down from the bus, got us there.Yes, as soon as you get down from the bus, you get lot of agents offering you rooms,quicker darshan, nice deals on flowers, offerings etc..Tourism is the only business in this area.We got our rooms - a 3-bed Non-AC room costing just Rs. 600.We could stay there till 9.00 pm some of us were good at bargaining. :) All we had to do was freshen up and leave.So by 3.30 to 4.00, all of us took bath and left for the darshan. What is there to see : If you wish to go to Shani Shingnapur, there are vehicles available which will take you there. And you can finish the entire trip in 4 hours.Most people do that, when they visit Shirdi. 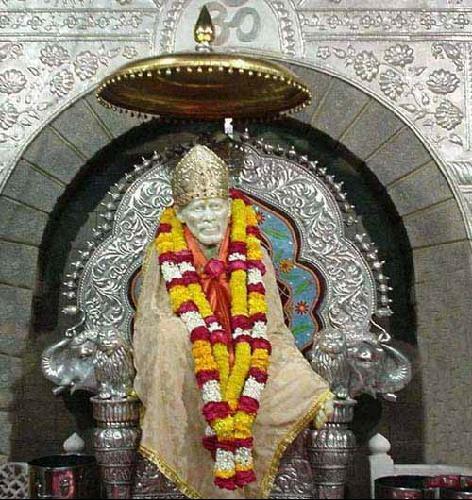 Shirdi is famous for the shrine of Sai baba.It is maintained by the Shri Sai Baba Sansthan Trust. If you have never been there,you may want to know how it is structured, where to start, etc. There is a main entrance near the temple road to the extreme end (Now, the mall end). which is the starting point. Now, this is the main entrance to the temple i.e. where the shrine of Saibaba exists. The "temple complex" has many other structures like - dwarkamai,other temples,counters etc. including the main temple aka Samadhi Mandir. This queue which you have joined would take you directly to the main temple and once you get out of it, i.e. after darshan, you can go to the other areas,as mentioned.You can even go directly to these other temples,instead of going to the main temple, but through other entrances, but not through this main entrance.The main entrance will lead you directly to the main temple - samadhi mandir.In olden days, you needed to hand over mobiles, cameras at a counter just outside the main temple for a rupee or two. Now,that has changed, we were quick to find that at the main entrance itself. The security guard asked us not to carry any mobiles or cameras in the temple complex.Although the counter was not very far from the main entrance.It was just across the road. It was so hot, and we were bare feet too.So you can imagine how hot it felt.Anyway, they accepted our stuff for just 2 Rs. per bag. No need to worry here.Its maintained by the temple trust and its safe to keep your valuables there.Just don't loose the token. There was a huge queue here.Usually visiting the temple around 4 pm, you may face long queues. The last time we visited Shirdi, we had a night trip, which meant an early morning darshan.And at such times, the queues are usually on the shorter side.However, that was not the case this time.There were hordes of devotees waiting in the queues for darshan.Devotees of all races, castes, classes, professions joined the same queue for darshan.Some with huge garlands, some with small flowers, waiting with eager eyes to find a glimpse of the almighty.Chants of "Sai baba ki Jai" erupted regularly. In case of long waits due to the queues, there were counters for water, juices, food items along side the queue within the temple. In about a hour and half, we were in the the main temple known as "Samadhi Mandir".Here, the queue got split into two.Each one moving on either side of the lord's statue. We choose to move into the right. one As that would have meant getting to touch the feet (Paduka) by kneeling down.There are priests near Lord's samadhi (Final Resting place) to manage the queue and also to take our offerings for the Lord.They usually take some offerings and return the rest, as prasad.So within minutes, we reached the samadhi, finished our prayers and were out of the main temple. Yeah, thats how quickly the queue moves. The temple complex : As you move out of the exit of main temple, you find youself in the temple complex.The temple complex has many temples of other deities too viz. 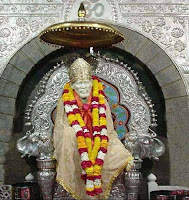 Hanuman, Shiva, Shani Dev.The first thing you notice is the tree under which Sai baba used to sit - Gurustan.If you walk parallel along the main temple, there is a small window in the main temple, which offers you a direct view of the Lord's statue. One of us ended up with an extended session of praying.I won't go into too many details of the temple complex. But, just an overview. Apart from the different temples of Hanuman, lingam, durga, there are prasad distribution centers.Udi (holy ash) distribution centers, Donation counters, museums, granthalaya (books-center), counters offering water, lassi, butter milk.After our darshan, we moved out of the temple-complex through exit 3. We had to visit Dwarkamai, which as on the right. Dwarkamai is a mosque where Sai baba used to stay. The queue for it was way too long. We skipped Dwarkamai this time. However, inside you would find some of the things Sai baba used in his daily life.We then proceeded towards buying some Shirdi laddoos. This is outside the temple-complex.When you get back to the main entrance road. Just keep walking toward the left. Its called "Prasadalay".We bought 10 packets of shirdi ladoos. Each costs Rs. 10 (4 pieces).Unfortunately we had to stand in a queue each time.Yeah, they give only one packet per person.But, it was a small queue so no worries. Return journey : By the time we finished our lunch (at dinner time;) It was 8.00 pm.We spent some more time buying lockets, Saibaba photos,etc..Remember, We still had to check out from the hotel.But before doing that, we were looking at options to return back.We walked our way to the S.T. Stand. which was away from the main temple road(Manmad/nagar road). There were S.T. buses at regular intervals to Mumbai. However, some of us wanted to go by A/C bus. There are no dearth of options from Shirdi.So we went back to the main temple road. There we found a bus service( I think Rajhans), which was leaving at 9.30 pm(Rs. 350/- per person). The agent told us, "If you can reach here by 9.30, the bus would wait".It was already 9.00 pm. So we rushed back to our room.And guess what, we were faced with a unique situation - lights out!!! One of the phases was down, and there were no lights. The hotel attendants provided us with a torch light.One of us held the torch - and for the rest..the search was on - did I keep my camera back, my mobile, that towel - was on everyone's mind.Luckily there wasn't much for this trip, so we packed our stuff in that torch light and checked out in a hurry. As we reached the place, the agent was missing!!! Frantic calls!!! The bus was no where in sight! !There was someone else, who said, the bus on the Nagar/Manmad road.We ran our way...as we reached the place..the bus had already left!! Few more calls..the agent had arranged for an auto. The chase began!! !In cities, the max number of passengers is usually 4.Here, there were 12! !We just stuffed ourselves in...Thoughts began.. were...Are we on the right trail? Would we get our bus?...A petrol pump in sight...And there it was...the bus was waiting for us. Rest of the journey was not so exciting - as usual we dozed off ;) But, it was an exciting end to our nice little trip to the land of Sai baba - Shirdi.